Having established the firm as Sage Intacct's strongest partner and overall Partner of the Year for 2014, 2015, 2016, and 2017, AcctTwo's move from #79 to #51 in the VAR 100 continues to demonstrate the firm's growth trajectory. AcctTwo, a leading consulting firm and provider of cloud-based financial management and managed accounting solutions, announced that it has been named to Accounting Today's VAR 100 List for 2017. Accounting Today is the leading provider of online business news for the tax and accounting community, offering breaking news, in-depth features, insightful editorial analysis, and a host of web-related resources and services. 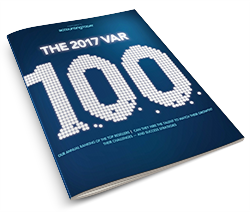 Their annual VAR 100 list ranks the top resellers in the accounting space, and dives into the major issues they’re facing, as well as their strategies for success. Having established the firm as Sage Intacct's strongest partner and overall Partner of the Year for 2014, 2015, 2016, and 2017, AcctTwo's move from #79 to #51 in the VAR 100 continues to demonstrate the firm's growth trajectory. AcctTwo has, in just six short years, established itself as the go-to consulting firm for Sage Intacct and other cloud-based financial management solutions, as well as a leading provider of Managed Accounting Services (MAS) delivered via a powerful shared services model. AcctTwo's partnership with Sage Intacct, the industry-leading best-in-class cloud accounting ERP for mid-market companies, continues to have a bright future as more and more businesses move their financials to the cloud, taking advantage of powerful automation, insight, and performance. And the firm's recent move to become a full-fledged sales and implementation partner for Adaptive Insights will enable AcctTwo to provide turnkey finance solutions - as well as managed accounting and analytics services - to companies and nonprofits from start-ups through the top end of the midmarket. "We're very proud of our continued success and we're excited to make the VAR 100 list again," said Marcus Wagner, CEO and Founder of AcctTwo. "I credit a sales team that focuses on a consultative sales process, a professional services team dedicated to customer success and satisfaction, and our partnership with Sage Intacct and their commitment to supporting their channel partners."